This minimalist, modern web site is one of our more deceptively powerful creations. It allows people to find ethically made clothing companies and sort them using a multi-layered search. So if you want to find American made clothing, you can sort it by Made in the US/UK, as well as the usual Men’s, Women’s, and Kids departments. BetterThread is the best place to find ethical clothing companies. 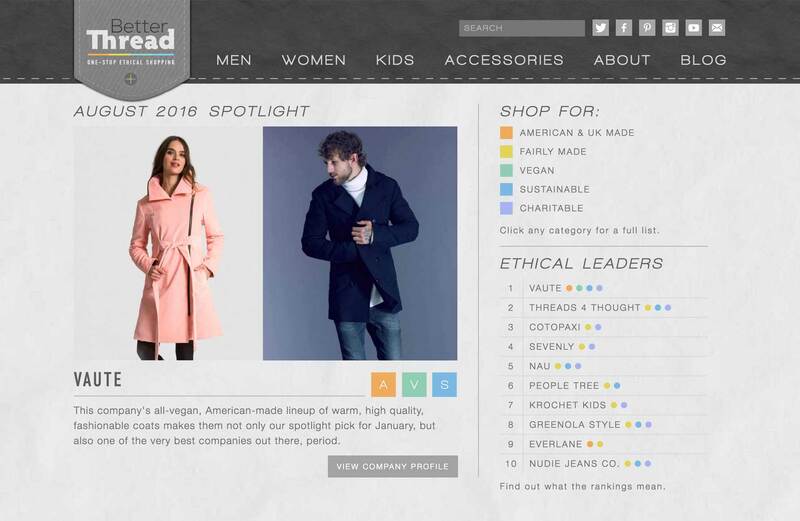 The site finds the best companies making clothes for men, women, and kids and grades them based on how well they treat people, animals, and the environment. Users can then search those companies by type of clothes or by ethics badges, including American Made, Fair Trade, Vegan, Sustainable, and Charitable criteria.